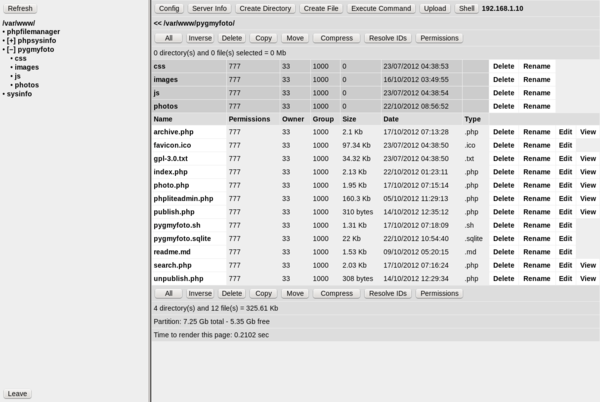 The phpFileManager (phpfm) file manager can come in rather handy when you need to juggle files on your web server from the comfort of your browser. Since the entire application consists of a single PHP file, phpfm requires no installation: simply drop the script into the root of your server, and you are good to go. However, before you start using the script, you might want to tweak the default settings. To do this, press the Config button which opens the configuration window. At the very least, you should protect phpfm with a password. In addition to that, you can specify the file manager's default directory and enable error reporting. phpfm packs all essential commands for managing files and directories, including create, rename, copy, move, and delete. Naturally, the file manager allows you to upload files to the server using the dedicated Upload button. The application also lets you view common file types, such as GIF, JPEG and PNG images as well as text files. Thanks to the built-in editor, you can edit text files, too. This feature can be particularly useful for editing PHP scripts, HTML pages, and text files stored on the server. Need to run a shell command? phpfm offers two ways to do that. The Execute Command button lets you run a single command (e.g., cp index.php index.php.old), while the Shell button opens a separate window with an interactive shell. phpfm has been updated for quite a while, but it runs perfectly well on the latest version of the Apache/PHP stack.